Chelsea have the opportunity to return to winning ways when they welcome bottom side Huddersfield Town at Stamford Bridge this weekend. The Blues suffered a shock 4-0 defeat at Bournemouth in midweek and this has dropped them from the fourth position on goals scored compared to Arsenal. Chelsea have solely relied on Kepa Arrizabalaga for the goalkeeping duties in the Premier League and that is unlikely to change for the visit of Huddersfield Town. However, Maurizio Sarri may consider changes in the backline with Emerson and David Luiz probable candidates to make way from the starting lineup. Should this be the case, Cesar Azpilicueta should feature on the right side of the backline with Marcos Alonso returning on the left while Andreas Christensen could be handed a rare league start alongside Antonio Rudiger. In midfield, Jorginho has regularly acted at the holding midfielder and based on Sarri's recent selection, he is unlikely to make a change. Alongside him, N'Golo Kante and Ross Barkley may feature, thereby dropping Mateo Kovacic to the bench. Upfront, there could be a straight swap between Pedro and Willian on the right wing. 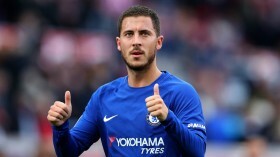 Eden Hazard should partner Willian on the opposite flank with Gonzalo Higuain expected to make his home Premier League debut leading the line.